Forecast safety concerns & capacity problems before an issue or crisis with complete Airborne HD-LiDAR services provided by Axis Geospatial. 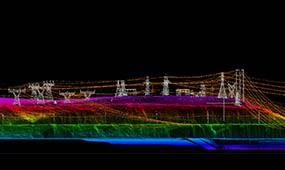 Assisting you with the design, expansion, and asset management aspects of your substation projects, LiDAR is a powerful tool that will provide you with extremely detailed and accurate 3-D models of your substations. Whether you need elevation models for right of way permitting or orthoimagery for your design team, contact Axis Geospatial today to discuss your next transmission line project.